Part of the mission of Delicious! Catering is to give back to the community. We do this by supporting non-profit organizations with discounts and donations. We also want to give back to our environment, and that has led us to become the first and only Green Certified Business in the field of catering in Marin County. There are 3 cornerstones to our green program: Reduce, Reuse, and Recycle. At Delicious we strive to reduce our use of energy. We conserve electricity by adjusting our heating and cooling thermostat, by using methods that prevent loss of cold air in our refrigerators, and by installing energy saving programs on our computers. We work closely with many local growers and vendors to promote local organic food production and to reduce greenhouse gases due to long distance transportation. We also strive to reduce our contribution to the landfill by using biodegradable plates and cutlery, and by composting as many food scraps as possible. We have completely eliminated the use of any Styrofoam products. We encourage carpooling by our serving staff to our events to reduce carbon emissions. For events, we recommend that clients rent glasses, plates, etc. instead of disposable products. We also reuse our décor elements, when possible. This means choosing reusable vases for flowers and trays and platters for food. We encourage our clients to consider giving useful items as gifts or favors, such as coffee cups or edible gifts. We give our clients the option of donating any leftover food from their event to a local homeless shelter. The paper we use in our office is 100% recycled. We reuse the back side of most paper for internal office use, and then it goes into the recycling. We also recycle all of our bottles, cans, plastics and cardboard. If appropriate containers are not provided, we bring back recyclable items from our events so they don’t end up in the trash. We are proud to be a business that values our environment. We hope we can help others to recognize the need for the 3 R’s, and we encourage everyone to be mindful of what each of can do to protect our earth and its valuable resources. 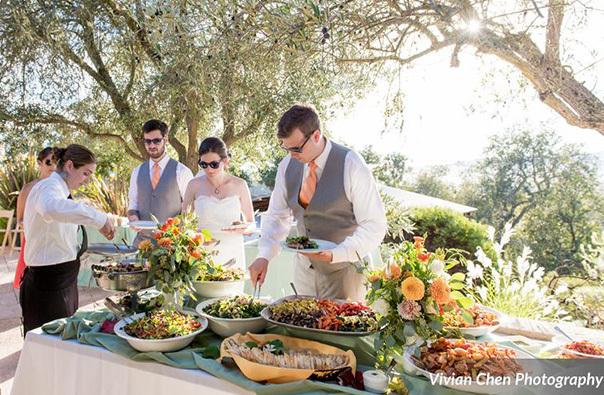 Marin County is lucky to have Delicious Catering as part of our community. Delicious catering is reliable, professional and delectable. Twice nominated Green Business of the Year, they have been an active member of the San Rafael Chamber Green Committee for years. Delicious Catering is as tasty as they are socially responsible.